The Curran Theatre, located at 445 Geary Street between Taylor and Mason Streets in the Theatre District of San Francisco, California was opened in February 1922, and was named after its first owner, Homer Curran. As of 2014, the theater is owned by Carole Shorenstein Hays. Homer Curran operated another theater with his name for several years prior to building this Curran Theatre; however, the original Curran Theatre had various names before and after this time, whereas this Curran Theatre has never had another name. It opened in February 1922 and was initially a Shubert house. Later, it was a showcase for Theatre Guild presentations. Subsequently, it became closely associated with the Civic Light Opera (CLO), which also operated in Los Angeles. The CLO obtained numerous prestigious bookings as well as produced their own shows, often with stars as the lead roles. Curran wrote the book for the musical Song of Norway and co-wrote the book for Magdalena. He eventually left San Francisco for southern California, where he rented theatrical lighting. For many years, the San Francisco Opera performed its annual "Spring Opera" series at the Curran. In 1977, the Civic Light Opera shifted its operations to the Orpheum Theatre, and by the end of that year, Carole Shorenstein Hays and James M. Nederlander assumed operation of the Curran and launched their Best of Broadway season starting with John Raitt in the national tour of Shenandoah and including the West Coast debut of Annie. Later, Shorenstein changed the name of her organization to SHN. In 2015 Shorenstein left SHN, focusing her attention solely on the Curran. SHN no longer operates the Curran. The theatre closed in September 2015 for renovations. Work included new upholstery for seats, carpeting, mechanical and electrical systems as well as expanded and upgraded lobbies. While work was underway, the theatre presented non-traditional works in a series called Under Construction in which the audience entered and was seated on the stage. The Curran reopened January 25, 2017 with the musical Fun Home. The ceiling above the main lobby was hand-painted to look like wood (steel wool was used to fashion a wood grain effect in the plaster before painting). The main lobby has a marble floor but has long since been covered by carpeting. There are "plugs" built into the lobby floor in which to insert stanchions from which theater ropes were hung to section off the lobby. The loge section was modified prior to Hello, Dolly! 's first booking at the theater. Originally, the loge section was similar to the boxes, with movable chairs in sectioned areas. The box-like loges are still evident by what remains of the metal railings in front of the loge section as well as the decorative plaster when viewed from below. The change was made because it increased the seating capacity by about ten seats in this highly desirable area. The interior main floor lobby no longer exists. Originally, it was changed to a minor degree to accommodate the installation of a sound booth without decreasing the orchestra seating capacity. Eventually, the lobby space was used to install a larger bar area as well as accessible restrooms. The theater has two front curtains: the decorative green fire curtain in front of a gold curtain. When musicals traditionally utilized each theater's front curtains, the first curtain would be raised five minutes prior to the start of the show. There were two coat check rooms: one off to the south of the main floor interior lobby and the other on the balcony (adjacent to the ladies' restroom). There were also two telephone "booths" on the mezzanine lobby—one on each side of the windows. These booths were actually very small rooms with formal doors. The coat check rooms and telephone booths are now used for storage. The theater also had a central vacuum system. This system is still evident by the connection points on the walls, near the floor. The chandelier was built in San Francisco by Phoenix Day. A plaque honoring Arthur Mayer is mounted at the entrance to boxes L-M-N. Mayer watched the theater being built, was hired by Curran as part of the theater's opening-night staff, and continued working at the theater until he was nearly 100 years old. The Curran has hosted more pre-Broadway engagements than any other theater in San Francisco. Productions that have been staged at the Curran prior to moving to Broadway have included A Chorus Line revival (2006), Beautiful: The Carole King Musical (2013), Biloxi Blues (1985), Brighton Beach Memoirs (1983), Carnival in Flanders (1953), Dame Edna: Back With a Vengeance (2004), Fences (1987), Gigi (1973), Head Over Heels (2018), Home Sweet Homer (Odyssey) (1975), Hugh Jackman in Performance (2011), Jitney (2002), Kismet (1953), La Boheme (Baz Luhrmann's production) (2002), Lennon (2006), Lestat (2005-2006), Magdalena: a Musical Adventure (1948), Martin Short: Fame Becomes Me (2006), Oliver! (1962), Peter Pan (1954), Pickwick (1965), Ring of Fire (2006), Soft Power (2018), The Grand Tour (1978), Three Wishes for Jamie (1951), White Christmas (2004-2005), and Wicked (2003). Broadway national tours have played at the Curran Theatre throughout its history. As operated by SHN, the Curran hosted five years of Andrew Lloyd Webber's The Phantom of the Opera, becoming the show's longest domestic run outside of New York City. Other significant long runs presented by SHN at the Curran include Les Misérables, Jersey Boys, They're Playing Our Song, as well as Lily Tomlin in Jane Wagner's The Search for Signs of Intelligent Life in the Universe. Harry Potter and the Cursed Child will begin at the Curran in Fall of 2019. During its run, Ambassador Theatre Group is set to operate the theatre. In the 1950s, the theater was used for the interior and exterior scenes of a Broadway theater in the movie All About Eve. The original main floor interior lobby can be seen in this film. All the theater scenes were filmed at the Curran except for the dressing room interior. *The television series The Streets of San Francisco filmed an episode inside and outside the Curran. In the program, the Curran is used as the setting for A.C.T. In reality, A.C.T. operates at the adjacent Geary Theatre which is also visible in some shots. ^ Cox, Gordon (September 17, 2015). "San Francisco's Curran Theater to Get Makeover Courtesy of Carole Shorenstein Hays". Variety. Retrieved 2016-03-15. ^ Hetrick, Adam (March 14, 2016). "Broadway's Fun Home Sets Initial Cities for U.S. Tour". Playbill. Retrieved 2016-03-15. ^ "A Chorus Line Revival To Play San Francisco's Curran Theatre in 2006". Broadway World. March 3, 2005. Retrieved January 16, 2017. ^ Simonson, Robert (August 31, 2004). "Dame Edna: Back with a Vengeance Begins Pre-Broadway Run in San Francisco Aug. 31". Playbill. Retrieved April 15, 2015. ^ "August Wilson's Fences". Marin Theatre Company. March 18, 2014. Retrieved April 15, 2015. ^ Adam Hetrick (April 10, 2018). "Go-Go's Musical Head Over Heels Begins in San Francisco". Playbill. Retrieved June 17, 2018. ^ . Amazon.com. Retrieved on 2019-01-08. ^ Kristina (July 8, 2011). "Broadway May Soon Host Hugh Jackman In Concert". Hugh Jackman Fan. Retrieved April 15, 2015. ^ Connema, Richard (March 17, 2002). ""The Best of Broadway" Series Presents Jitney at The Curran Theater". Talkin' Broadway. Retrieved January 16, 2017. ^ Jones, Kenneth (October 15, 2002). "La Bohème Opens Pre-Broadway Run in San Francisco Oct. 15". Playbill. Retrieved April 15, 2015. ^ "Season History 2006". SHN. Retrieved June 5, 2015. ^ Jones, Kenneth (July 28, 2005). "Maltby Ignites Ring of Fire, the Johnny Cash Musical, in Buffalo Sept. 2, Prior to SF and Broadway". Playbill. Retrieved January 16, 2017. ^ "Review: 'Soft Power' is a bold new style of theater at SF's Curran". The Mercury News. 2018-06-23. Retrieved 2018-07-01. ^ Gans, Andrew (May 28, 2003). "Wicked Flies Into San Francisco's Curran Theatre May 28". Playbill. Retrieved January 16, 2017. ^ "Harry Potter and the Cursed Child Will Play San Francisco in 2019 | Playbill". Playbill. Retrieved 2018-07-16. Wikimedia Commons has media related to Curran Theatre (San Francisco). 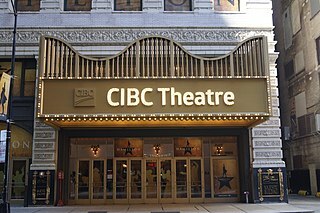 CIBC Theatre is a theater located at 18 West Monroe Street in the Loop area of downtown Chicago. It is operated by Broadway In Chicago, part of the Nederlander Organization. Opened in 1906 as the Majestic Theatre, it currently seats 1,800 and for many years has presented Broadway shows. In its early years, the theater presented Vaudeville celebrity acts. Stephen Sondheim Theatre, formerly Henry Miller's Theatre, is a Broadway theatre operated by Roundabout Theatre Company, located at 124 West 43rd Street, between Broadway and 6th Avenue, in Manhattan's Theater District. 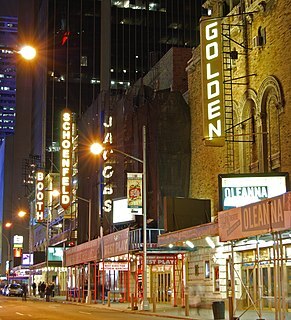 The James M. Nederlander Theatre is a theater located at 24 West Randolph Street in the Loop area of downtown Chicago, Illinois. The venue opened in 1926 as the Oriental Theatre, a deluxe movie palace and vaudeville venue. Today the Nederlander presents live Broadway theater and is operated by Broadway In Chicago. It currently seats 2,253. In 1978, the theater house and its office building were listed on the National Register of Historic Places as New Masonic Building and Oriental Theater. The office building is now a hotel. In 2019, the theater was re-named for impresario, James M. Nederlander, of the Nederlander Organization. The SHN Orpheum Theatre, originally the Pantages Theatre, is located at 1192 Market at Hyde, Grove and 8th Streets in the Civic Center district of San Francisco, California. The theatre first opened in 1926 as one of the many designed by architect B. Marcus Priteca for theater-circuit owner Alexander Pantages. The interior features a vaulted ceiling, while the facade was patterned after a 12th-century French cathedral. The Orpheum seats 2,203 patrons. In 1998, after a previous renovation in the 1970s, a $20 million renovation was completed to make the Orpheum more suitable for Broadway shows. The theatre is a locally designated San Francisco landmark as determined by the San Francisco Landmarks Preservation Advisory Board. The Golden Gate Theatre is a performance venue located at 1 Taylor Street at the corner of Golden Gate Avenue in San Francisco, California. It opened in 1922 as a vaudeville house and later was a major movie theater. In the 1960s it boasted a Cinerama screen, but by the early 1970s it had declined and was showing blaxploitation films. It was restored and reopened as a performing arts venue in 1979. Carmen Cusack is an American musical theater actress and singer. She is known for playing Elphaba in the Chicago, North American Tour and Melbourne productions of the musical Wicked, as well as for originating the role of Alice Murphy in the Broadway musical, Bright Star.